Oh I do love surprises! Imagine how thrilled I was when I walked up on the front porch after a long day of shopping for Roller Derby props and discovered a small brown package sitting by the mailbox. At first glance I thought it was the copper bell with clapper I’d ordered from Amazon.com. As a matter of act I was so excited I raced inside with the box and started opening it up without even looking to see who it was from. As I began removing packing peanuts from inside the box the first item I encountered was a small stuffed animal in the shape of a horse. Expecting a cowbell I was a little confused and quite frankly I wondered just what the heck a stuffed animal was doing in my package. Well, I thought I’d figure it all out once I found the expected cowbell and the inevitable packing slip that always accompanies a U.P.S. shipment so I continued digging through the Styrofoam packing. Imagine my further surprise when I came across a pair of house slippers with the phrase “Born to Be Wild’ emblazoned across the front of each shoe. My first thought of course was that someone knows my tastes quite well. I tried them on immediately and they were a bit snug, but I figure if I wear them for awhile they’ll loosen up and fit just fine. As you can tell from the picture they’re a pretty snazzy pair of slippers. Last but not least the box contained a tin of candy from Church Hill Downs. That’s when it finally dawned on me and I figured out what was going on; someone had figured out it was my birthday and had sent me a present. I searched the rest of the box and didn’t find a birthday card or a packing slip so I turned the flaps of the box back over to see if there was a return address on the box top. Sure enough the mystery was solved and it turned out that my very good friend, Pepper had sent me a birthday gift. Pepper, the house slippers look wonderful on me and you couldn’t have picked out better colors or style. I am also in love with the little stuffed horse but how did you know my Chinese horoscope sign was the Year of the Horse? I’m very impressed. The candy from Church Hill downs is very tasty too. Thank you so very much! I did have one question though. The package is addressed to Dirk, Felicia and Micah, but as hard as I looked through the box I didn’t find anything for either one of them. Oh well, their goodies must have got lost in the mail. Thank you Pepper and Jane; I’m going to ask my Mormon wife if she’ll let me add the two of you to the family. Okay people, Pepper has set the bar pretty high and I'm sure you'll all be wanting to shower me with equally wonderful gifts. Oh, this is going to be my bestest birthday ever! I can just feel it. DirkStar, Thursday, September 06, 2007 21 Tie-Dyed Hippies. Glen and Judy enjoying Dragon's baseball. Well I don’t know how you’ve spent the last weekend of summer so far but the Bauman family has been burning up the days with a final flurry of hot activities. 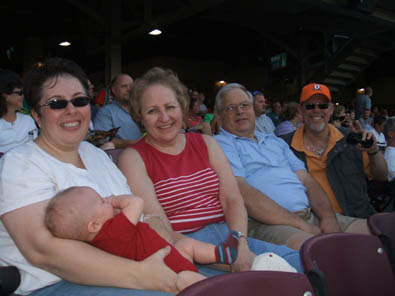 It all began with a Friday evening at the local ballpark taking in a Dragons game with our good friends Glen and Judy. The hometown heroes won and it was a good time for all. I’d tell you more about it but I was sworn to secrecy and unfortunately all the details are off the record. Saturday morning began with breakfast at the Waffle House. Soon afterwards we were off to the suburbs of Cincinnati for some shopping. Our first stop was the Aveda Salon where we redeemed my birthday certificate for a custom made Pure-fume just for me. It was a lot fun sampling all the variety of scents until I found the one just right for my particular taste. Eventually I settled on a scent called something like, The Essence of Emilie’s Garden of Sensually Passionate Delights. I think it really compliments the bold masculine nature of my manly personality. Um, it smells heavenly on me. See the Safari Vest on the left? I own it now. 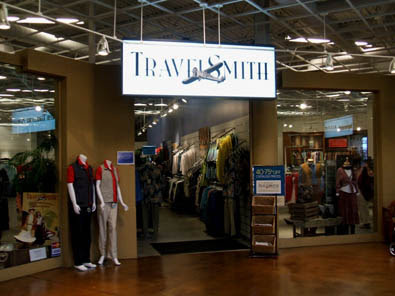 Our next stop found us in the Travel Smith Store where I purchased a new Safari Vest. All the great writers I’ve ever seen pictures of are wearing them so it just seemed like a perfect fit for me. See the Grey one on the mannequin on the left? That’s the one I got and it makes me look just like Hemingway in Spain. I feel more literate already. Our final stop for the day found us at the Cincinnati Mills Shopping Mall. We did some exploring (I can say that because by now I was wearing my new Safari Vest.) at Steve and Barry’s where we went hunting for rare finds amongst the new Sarah Jessica Parker line of quality fashion. Oh yes, we were going after the big game. We found some really cool items for Micah but little in the way of high couture for Felicia or me. Just before a break for lunch we concluded our morning adventure with a brief foray into to wilds of Babies R Us. It was indeed a jungle in there but we did manage to capture a good deal on a Bumbo for Micah. For those of you not familiar with the device it allows a little one to sit up and enjoy the benefits of a vertical perspective. (See how fancy my erudite phrases of prodigious prose are becoming now that I’m wearing my Safari Vest?) 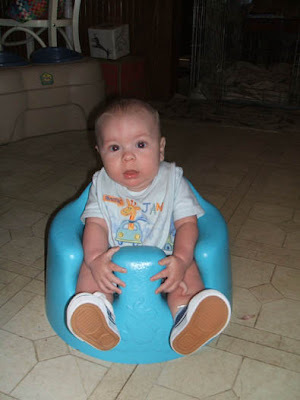 He loves the chair and it is lots of fun watching him as he sits and watches television in it. Okay, maybe the campfire was going a little too far. Our final stop yesterday was the Bass Pro Shop. We enjoyed a fine lunch of Bison Franks, Big Jim’s Survival Slaw and Pete’s Pickled Toenails. No, it was not Felicia’s first choice of quality cuisine, but I was the one wearing the Safari Vest after all and as such it entitled me to order food for the both of us. 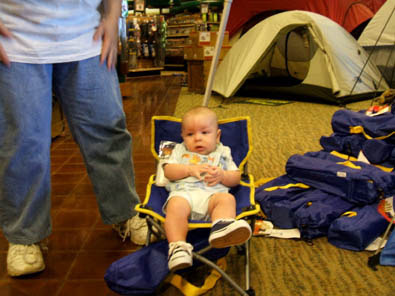 After lunch I spent some acclimating my son to the joys of camping. As you can see from the digital photograph he clearly loved it. Unfortunately the Bass Pro Staff were not so nearly enamored when he started the campfire. After that our visit was cut rather short and we were forced to make a hasty exit. Jesus calls it like he sees it. What adventure would be complete without a little sight seeing? Living in the cultural cornucopia that is Ohio it is never difficult to find skillfully crafted artistic expressions of mankind’s search for greater meaning and purpose. 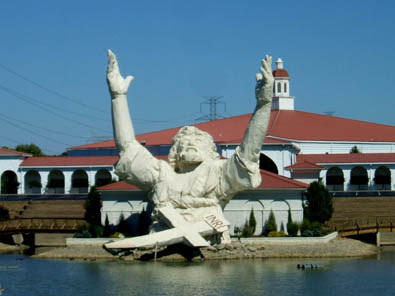 Among my personal favorite pieces of sculpture is the bigger than life bust of the universe’s number one deity, Jesus (the son of man) Christ, that beckons all travelers to join him in a celebration familiar to all football fans everywhere. Yes, God has scored the winning touchdown and Satan has been defeated by a final score of 1 to 666. Kinda makes you glad to have Jesus as your starting quarterback does it not? Who is that rugged guy in the cool Safari Vest? 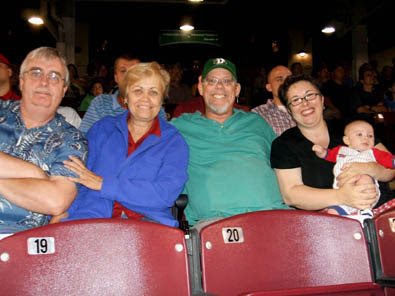 Sunday was another Dragon’s Game preceded by dinner with our very good friends, Tom and Karen. The game was simply the best one we’ve been to all season long. We got to see back to back to back home runs. Yeah, it was completely cool. We got to watch the Red’s number one draft pick, Drew Stubbs, go 0 for 5 and inspire no small measure of hope for Cincinnati’s 2008 season. This Thursday begins the first round of the playoffs and we’ll be sitting in our usual seats rooting our hometown heroes on to victory. Felicia and Micah enjoying the excitement. Whew, it has truly been a fun filled holiday weekend and I think my tired little family could use a break. I got up early this morning, did the dishes and cleaned up the house so Felicia could get a little rest. As you can see from her baseball game photo it is clear she needs some time off to recuperate. I hope everyone had a great Labor Day and now that summer is over can we all get back to some serious blogging? 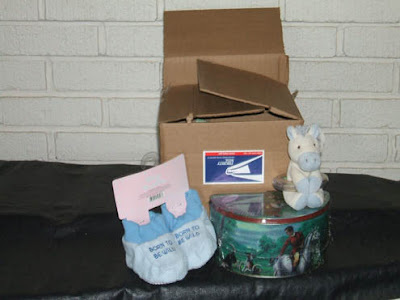 Oh, did I mention my upcoming birthday on the twenty-fourth of this month and the inevitable flood of fabulous presents I know are headed my way from all of my readers? DirkStar, Monday, September 03, 2007 19 Tie-Dyed Hippies.